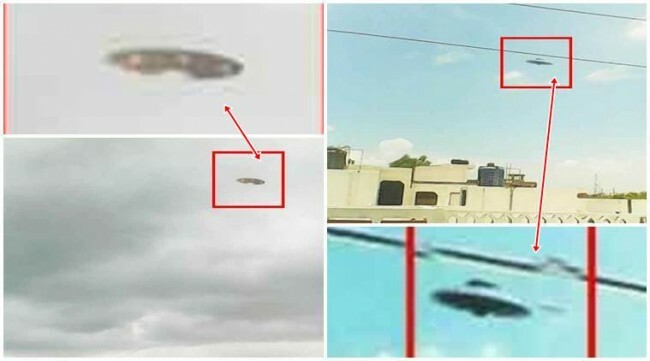 In a mysterious set of events, a UFO (Unidentified Flying Object) sighting has been reported in the city of Kanpur in North India and the shocking images of the incident have been shared as evidence. A young boy has claimed to have spotted the UFO in the early morning on Wednesday, June 24, 2015. This report comes just weeks after the prediction of an impending meteor strike in the month of September 2015 went viral. Although NASA has debunked the prediction of doomsday, they came out with another statement about the agency’s plans to use nuclear weapons against any incoming asteroid to protect the Earth. The boy has said that he was going through the pictures of early morning clouds that he had clicked, when he spotted a distinct UFO in the images. He alerted his parents about this and they have now shared the images with the media. The boy is a fan of nature photography and has spoken to media about the incident. He said that he saw unusual shapes of the clouds in the sky on that particular day and started clicking pictures using his phone camera. Later, when he was checking the photos captured in his cell phone, he saw a round object resembling a flying saucer. He saw the object in many of the photos that he had clicked and when he zoomed in on the images to take a closer look, he realised it was a UFO. The boy’s father, Santosh Gupta, has also confirmed that the flying saucer-like object in the images is a UFO. He said that he had checked all the pictures clicked by his son and mentioned that he saw a string of red light spots around a white-colored object. Gupta also said that on closer examination of the images, it appeared as if the UFO was emitting a white smoke from its center. The boy lives with his family in the Shyam Nagar area of Kanpur, in the state of Uttar Pradesh (UP) in India. Gupta has agreed to get the photographs verified at any laboratory for their authentication and has claimed that the images are 100 percent real. 4 Responses to "UFO Sighting Reported in North India, Shocking Images Show Evidence"
Don’t be fooled. These UFO images are known to come from certain rogue smartphone apps that spread e.g. by email and install themselves without the recipient’s knowledge. They can then randomly insert bitmaps in any photo where an expanse of sky is detected. the skepfags will find a reason to debunk it as usual, the intellectual cowards.